Henna is an excellent herb that can be used to condition and color your hair. 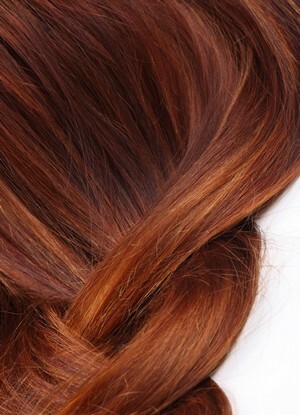 This natural colorant gives your hair a nice reddish-brown tint. The scientific name for this herb is Lawsonia inermis. Henna powder is earthy green in color and smells like fresh-cut hay. You can prepare a simple henna hair pack by mixing henna (you would need about 100g of henna powder for chin length hair) with hot water (preferably distilled water), sufficient enough to form a smooth paste with the consistency similar to that of toothpaste or soft yogurt. Leave this paste overnight or at least 6-8 hours and then apply it generously on your hair. It can be applied on dry as well as wet hair. For convenience, divide your hair in various sections and then apply the paste in each section and roll it up. After you are done applying, cover your hair with a shower cap or plastic bag. Leave it for about 3-4 hours and then rinse it off under a shower or tub faucet. You can now shampoo your hair or simply use a conditioner. It is suggested to use this henna hair treatment about once or twice a month. It helps balance the pH of the scalp, seals the cuticles, makes your hair thick, reduces dandruff, restricts premature graying of hair, prevents hair fall by strengthening the roots, and promotes hair growth. When purchasing this herb for hair masks, prefer to buy body art-quality henna powder. • Do not use metal containers or equipments when preparing or using henna paste as metals are likely to interfere with the herb. Hence, use wood, glass, or plastic implements. • As henna is a natural dye, any spills that might have occurred while making the hair pack would be difficult to remove if you do not clean them immediately. • Before using the henna paste, do an allergy test by applying a small patch behind the ear to rule out the possibility of allergy. • When applying the henna paste on your hair, apply a little olive oil or petroleum jelly around your ears and hairline to avoid staining skin. Needless to say, wear plastic or rubber gloves while applying the paste. Plus, you can wear an old long-sleeved shirt to avoid stains on your arms and shoulders. • Avoid using henna on chemically treated hair. Watch these videos to understand how make and apply henna pack on your hair. • Instead of water, combine henna powder with some herbal infusion to make a nourishing hair pack. For example, you may add in henna an infusion of green walnut leaves boiled in water to get rich brown shades. You may mix a little lemon juice, grapefruit juice, or any other acidic juice in it to get better color. To make the henna darker, add essential oils such as lavender oil, rosemary oil, tea tree oil, etc. in it. • Another common home remedy involves using a mixture of amla, cassia, and shikakai powder in henna. • In case you experience dry hair after applying henna paste, you may add plain yogurt in it. You can mix honey, too. For example, you can make a mixture of four teaspoons each of henna powder, yogurt, one tablespoon of lemon juice, and a teaspoon of honey. • Adding clove powder in henna paste helps deepen the color. Plus, you may mix coffee powder in it to get a darker color. For a lighter reddish tone, combine henna with chamomile infusion. • To stimulate hair growth, apply henna oil prepared by heating mustard oil on a low flame and boiling crushed henna leaves in it until the mixture turns brown. Strain the oil and allow it to cool. Finally, apply this oil mixed with lemon juice or yogurt, leave it for about an hour or two, and then wash it off.